Dietary supplement. Refreshing effervescent drink for the support of muscle function. For all who frequently suffer from muscle cramps. For people who are often under stress. For everyone who regularly engages in physical activity. For people who take medication for lowering blood pressure or consume other diuretics (coffee, tea, alcohol ...). Magnesium is an essential mineral, which means that our body is not able to produce it, so we need to consume it every day. About 20% of men and 32% of women do not achieve the minimum intake of magnesium. The most common symptoms of magnesium deficiency are muscle cramps. Magnesium 300 mg - Dietary supplement with sweetener. 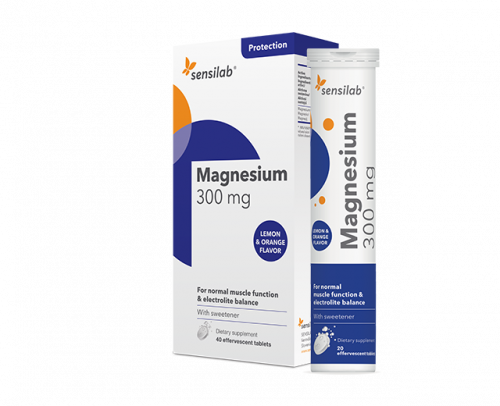 Active ingredients (in 1 effervescent tablet, recommended daily amount): magnesium 300 mg (80% NRV*). Use: Recommended daily intake is 1 effervescent tablet dissolved in a glass of water.